We started this series to get a look at the financial ins and outs of a web developer these days. Now we can wrap it all up by looking at the numbers all together. Let's assume a fresh start in independent web development. You'll be purchasing all software and hardware needed (as laid out in the previous posts) and you have an average load of clients paying you (as sourced from the poll). There is a very large (42%) contingent earning less than $1,000 per website. Another large contingent contingent (34%) earn between $1,000 and $2,000. 14% are between $3,000 and $5,000 and those left are up at the high end of the earnings spectrum. This doesn't tell the whole income story though of course, because it doesn't factor in number of completed sites in a year. If you earn $1,000 per website and do 25 websites in a year, you're earning more than someone who earns $20,000 per website and only does one. No surprise there. If we multiply one per-website earning by the number of people earning that much, the curve2 looks a lot different. 2 30,000 based on the rate of increase in the poll and the text "Over $20,000). 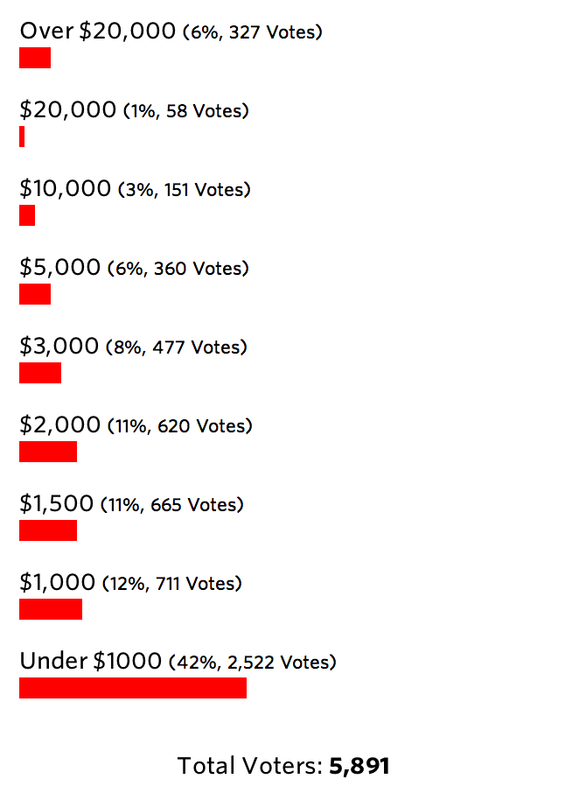 500 based on the rate on of decrease in the poll and the text "Under $1,000". There is a spike at the high end, but the rest of the curve is a lot flatter. I think this says something about the market. There is a pretty even distribution across the entire spectrum of earnings. We don't have enough data to be absolutely conclusive, but I'd say based on this there is the most demand for very inexpensive websites. As you move up, there is less demand, but the higher rates make up for it. $19,546,500 ÷ 5,891 people = $3,318.03 average earnings per website. That number matches up fairly well with the numbers Matt Mullenweg shared in the 2012 "State of the Word" address (talk, slides). With 27,000 responses, the average earnings for WordPress-based client work was $2,500 with the low end being $2,000 and the high end being $4,200. The average there being about $50,000. These costs are based entirely off my own, which as I mentioned in previous posts are somewhat "premium." I have no doubt a more efficient/frugal/thrifty person could lower these costs significantly. I'd warn against being frugal at the cost of quality or efficiency though. Theoretically the first year is the worst. But you don't have to buy a computer every single year. Even I get an average of 2 years out of one and I suspect most people get more than that. You don't need to upgrade Creative Suite every year. In fact I suspect I'd be just as efficient if I was still on CS2 or CS3 (yet here I am, at CS6). Subsequent years will have less costs than the first. You will occasionally need new hardware though, and occasionally need to upgrade one-off software. I'd think subsequent year costs would hover around $8,000 on average. Poverty in the U.S. in 2012 is defined as earning $11,170 or less. At the average per-site earnings of $3,318.03 and first-year costs of $10,711.87, a person would need to complete and bill for seven websites ($23,226.21 billed, $12,514.34 earned) just to beat poverty. The second year, five websites. To earn the average $50,000 at the average per-site earnings, a person would have to complete and bill for 18 websites, or 1.5 per month. At the low end ($500 per site), that would be 121 websites in a year, meaning completing and billing for over 2 websites every single week. It gets a lot easier (seemingly) at the higher end of the spectrum when you think of a person completing a website every six months for $30,000 and hitting the average income. It doesn't take into account people at agencies or apps, which is a lot (majority?) very well. Anecdotally, most web developers I know aren't struggling at all. Still, pretty interesting stuff I think! I'd love to hear any final thoughts by those of you in this world and making it work (or struggling). I am a drupal developer, who I’ve heard generally make more money. But working 40 Hours a week contracted in making sites I average 50K a year. This is at the ‘cheap slave labor’ rate that I’m currently making being young and newer to the industy on a professional level (been coding since I was 14). But the other guy who works for him makes double what I make. I’m not sure if we’re just crazy expensive or because we develop from Drupal that we make a lot more money. Also worth noting we do everything. Setting up servers, designing, building out the site. It would have been nice to see the average amount of administrative work that goes into the different amounts earned for each site. It is my experience that the clients who can pay a higher rate also deal with you in the a more professional manner. This usually means more realistic deadlines and shorter phone conversations. Agreed. If you go too cheap people expect less out of you. You need to find the happy-medium. Chris did say this should be taken with a huge wheelbarrow of salt. haha. Something else to consider would be the people who participated in the survey but use freelance work as a supplement to their day jobs (which could likely include the same sort of work). In this case there is much less pressure to reach an income level. Yeah I work for an agency, and also do some freelance work on the side if I need the extra cash. Usually this is just for local small businesses, and I get no more than £500 – £800 for these projects. That may not seem like a lot to some people per project, but it’s usually only a WordPress or Pyro install, existing theme modified for that customer and can be done very quickly. A recent project I got only £300, but it only took me one night after work to complete, so £300 for less than 6 hours work is OK by me (Especially as this was just extra cash to go along with my monthly wage). As a 15 year old student in Sweden this bothers me quite alot. I love developing websites, but I’m not sure that I want it as a full time job “when I grow up”, since I’m not sure I’ll make as much money as I’d like to. from my experience if you’re good and know how to market yourself you make lots of money. It’s hard work but it’s totally worth it. Freelance web design, development, and marketing used to be part-time income. But I recently was let go from my fulltime job of 7.5 years. One cost that needs to be considered is marketing yourself and your business. There are certainly many free ways to do so but at some point your going to have to spend some money on marketing, unless your a well-known guru. Think business cards, promotional material, search ads, etc. I’m using all of these and more to market my business. These methods have certainly proven beneficial. I would think marketing would be a monthly variable expense. Google, Bing, Alexa, Manta would though. Something to think about. I just got my first client job and I am charging $2000. I think this is cheap but since I am still in school and looking to build a portfolio it is a good price. The site is a large project and I think once I have more experience and a bigger portfolio I would charge $3500 to $4000 for a site the size of the one I am doing. This post is a good thing for me to see because I am actually looking for some to develop a relatively large site for me, and now I know how much to pay and what is reasonable. It would be great to see people’s portfolios though to see what my money gets me. When I started building websites, I had a cheap computer+a cheap netbook, most of the software I used was free, and the only monthly costs I had went on hosting and internet connection. You don’t buy all these services+hardware+software before it is justified by the work you do and the money you make. In the first year it really isn’t 10,000$, it’s more like 1,500-2,000$ roughly. You also don’t make the average 3,300$ per site in the first year. As you get better – you earn more money and as a result, you can afford better software, services and hardware. I quit my job and started making websites for clients a few months ago. I mostly do small 1000$ – 2000$ websites. They are pretty easy to get when you are starting out.I make about one or two per month. My monthly costs are about 30$ per month, but I make about 60$ per month in passive income. thanks for your Study, but I think you miss some important points. On the cost side you miss office rent. Even if you work at home you need some space, so you have to inserts some of your rent to the monthly cost. Additional you miss education and networking costs especially fairs. I think you’re missing the point. If you’re starting off and you have no clients you shouldn’t rent an office. The best part of having a web company is it’s all online and you work from anywhere. I work from a couch. If you are currently using a computer somewhere then you already have a desk or a couch to work from. And rent is different depending on where you are, whereas what Chris talked about are always that price. You don’t need any education. I’m 100% ‘self’ taught. The internet is a powerful tool. The guy I work for is a complete genius and pays me cheap $25 per hour to make up for me learning. I know people who went to school and then have to be taught for 6 months before they’re worth anything. I think it would also be beneficial to see what countries people are from. This plays a large role in the amount that people are willing to pay for a website. I lived in Honduras for a couple years, and know that many businesses generally weren’t willing to pay over $1,000 for a website. Whereas now, in the US, I know that I can make double that for an average-sized WordPress site, and I’m just starting out. Now these figures help a lot to make pricing decisions but also to confirm that even though no guru myself I can still make a pretty decent living making websites. Oops my bad! I’ll update that. What? 12 + 11 + 11 = 34. I don’t get it? I answered your survey and I’m in that higher bracket so I figure I should give you the explanaition. I’m a salaried employee at a consultancy and I work as a (senior) Front-End Developer, most of the sites I build are pretty big Enterprise-type projects as part of a 5-10 person team (cancer.org being a recent example). I basically divided my salary by the number of sites/projects I’m involved with a year (about 4). I didn’t account for the piecemeal work I get in between big projects (site maintenance, graphics work, single/landing pages etc.) 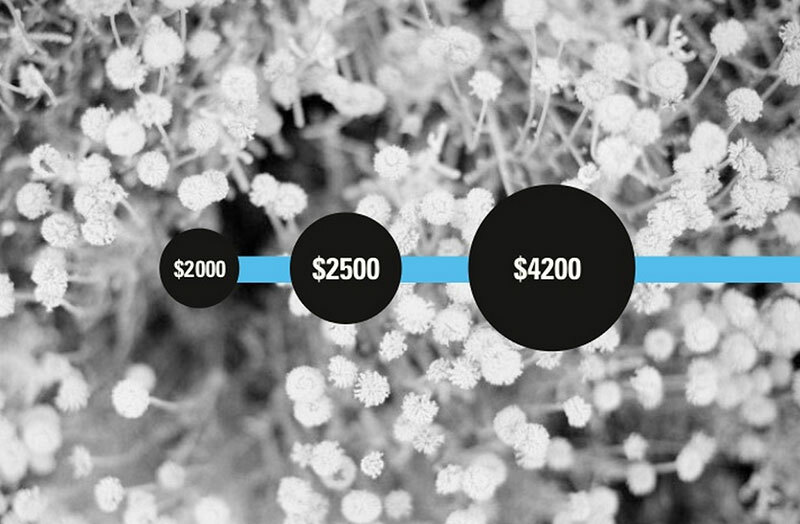 but even if I did the average would still closer to $20k than $10k per site. I’ve really enjoyed this “Web Developer Economics” series as I’ve often fantasized about breaking away and starting my own business, but since I’ve become accustomed to my salary (not to mention my benefits) I’m not sure how I would be able to make freelance/contract work worth it. I see what my billable rate is at my consultancy, but I don’t know what kind of clients would be willing to pay even close to that rate to hire a small one or two person outfit. In my community of about fifty-thousand people, my web development company caters to small businesses, individuals, non-profits and churches. Most of the people we cater to do not have the expendable income to put towards a website. We have yet to do a project over two grand. It seems we have to keep our fees a bit below average or we do not get the work. Case in point our maintenance fees start at $35.00 an hour. Today I am meeting with a potential client interested in our services, they would like to include a bit of bartering for payment. Not sure what to think on that one…LOL. Hey Todd, I’m in a small community as well, about the same size, serving similar clients. For church and non-profits, I discount my rates with the understanding that I’m doing this for a good cause. For the regular client I charge $45 per hour. There is no bartering. I can’t walk into any store and barter for services. The price is what it is. If they are happy with that obviously it’s your call. But, if you give them a lower rate and they tell their friend then you can set yourself up for lower rates going forward. YOU have an expertise, they need to respect that. I have done a website for ‘barter’ (got a new shower out of it!) I was happy to barter on that occasion as I needed the shower and didn’t have the ready money. I think it’s a situation that has to suit both parties. This particular website owner now wants some more pictures on his site and his hosting is due. I want a new floor in my shower room – sounds fair to me! Some professionals will make $2000- $3000 just from development, while others will make the same by doing everything from initial design to making the site live with content and SEO. That was very interesting for me, I work as a freelance web designer / front end developer, (earning less than I did when working for a salary in the past but having the freedom I was seeking for) – meaning I work for agencies & also get my own projects. I am currently somewhere in the middle of the chart, for answering the poll I have calculated all income I earn being a web expert – including some web maintenance, web training I do every few months, landing pages, FB design and so on, actually I would say for me all that “extra” (not directly web development work) ends up being half of my income, and also that’s kind of the bread & butter for me as this kind of work is usually more steady, whilst full web projects I might have a couple of one month but sometimes might have a month with no full scale web project contracted. and one more thing : chris how much u make for completed a website ? Great article ——, and mostly a great reminder to work up my own list. Great Article :) It’s true but sure it depends on where you live , for me I am living in middle east and I am working as a Junior front-end developer in a large company – large depends on our community – actually I am working 9h/day and got 2JD which ~= 3USD per hour, which is so cheap . I am trying to learn more about my career that may do some self projects, but even when you work here for people outside the company as a freelancer its hard, and they can`t pay you good specially those people who don’t know how the process is Finally its really depends where do you live! Oops ! Why my comment does not appear correctly , but on the comment preview its cool ?? ! Still somehow, they were able to standardized their services with latest tools, technology..
That is a great article which is full of developers information. Personally i love web development but due to short time i did’t learn it. After reading you this article now i am thinking to start learning web development. Good stuff keep it up and keep us updating about the developing world.